Vitamin A is a fat-soluble vitamin. It plays a role in a variety of function in the body, such as: vision, immune health - functioning as an antioxidant, bone metabolism, skin health, embryonic development, gene transcription and reproduction. This vitamin stimulates the production and activity of white blood cells, helps maintain the health of the cells that cover the body's interior surfaces, and regulates cell growth and division. The Institute of Medicine's current recommended intake of vitamin A is 900 mcg of retinol for men (equivalent to 3,000 IU) and 700 mcg of retinol for women (equivalent to 2,333 IU). Food sources of vitamin A or its precursor beta-carotene (from the highest to the lowest content): liver (cod, beef, pork, poultry), carrots, broccoli leaves, sweet potatoes, kale, butter, spinach, pumpkin, collard greens, cantaloupe melons, eggs, apricots. 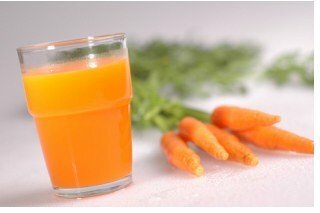 One common way we get our beta-carotene today is by juicing carrots, but what we miss most often is that for the proper activation of the A vitamin we have to have a very small piece of butter (or some other form of dairy fat) with the juice. A deficiency of vitamin C, zinc, thyroid hormones, vitamin E and/or selenium can lead to a deficiency of A. For the complete list of foods and vitamin A content in them click here. For the complete list of foods and beta-carotene content in them click here. It can occur as either a primary or secondary deficiency. Primary deficiency typically occurs among children and adults who do not consume an adequate amount of yellow (orange) and green vegetables, fruits and/or liver (cod, beef, pork, poultry). Early weaning from mom can also increase the risk of vitamin A deficiency in infants. Secondary deficiency is associated with chronic malabsorption of lipids, impaired bile production and release, low fat diets, and chronic exposure to oxidants, such as cigarette smoke. Zinc deficiency can also impair absorption, transport, and metabolism of A because it is essential for the synthesis of the A vitamin transport proteins. As A is a fat-soluble vitamin, disposing of any excesses taken in through diet is much harder than with water-soluble vitamins B and C. As such, toxicity of the A vitamin can result. This can manifest itself with nausea, jaundice, irritability, decreased sensation of appetite, vomiting, blurry vision, headaches, muscle and abdominal pain and weakness, drowsiness and altered mental status. Toxic effects of this vitamin have been shown to significantly affect developing fetuses especially during the period of formation of organs. The upper limit for retinol intake is 3,000 mcg, but intakes this high may increase the risk of hip fracture or interfere with the benefits of vitamin D.
Note that these toxicities only occur with preformed (retinoid) vitamin A such as from liver or found in fortified breakfast cereals, dairy products and juices. The carotenoid forms (such as beta-carotene as found in carrots) give no such symptoms; however, excessive dietary intake of beta-carotene can lead to carotenodermia which causes orange-yellow discoloration of the skin. One can get rid of carotenodermia by simply stopping consumption of foods containing beta-carotene for a period of time until these symptoms disappear.